We bought this drone as a next step up from the multirotors you get at a toy store. Overall I would say we are quite pleased with it, especially for the price ($150 on Amazon, but you can find for about $100 on eBay, which is what we did). She has brushless motors, which is probably the key differentiating feature which graduates you up from the ToysRUs drones (which are great for kids to start with for sure). 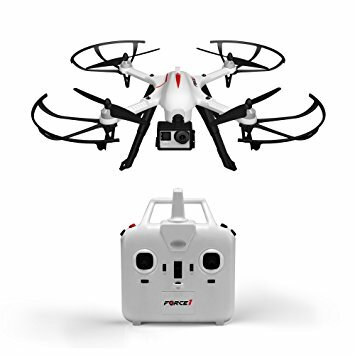 We seem to be heading toward racing FPV drones eventually (First Person View–racing drones where pilot only sees what the onboard drone camera sees) so I wanted something that could use to get familiar with the power of racing drones (in other words: brushless motors). The pro level FPV drones are seriously fast (like 0-80 mph in 1 second and up to 120 mph) and are a completely different piloting experience since you can’t actually see the drone–only what it is seeing. So we want to work up to that. This F100 is perfect. It’s a “Line of Sight”(LOS) viewing experience (like most RC experiences where you are watching it fly around–not FPV). The one thing we had a bit of trouble with was the unlocking feature. The F100 has a button on the transmitter (remote) you have to press to unlock the rotors. When you do it right, the rotors start spinning slightly to indicate they are ready for throttle. But if you hold that same button (the red one) longer, it also turns off and locks the rotors (so it’s safe to approach and hold the drone). Seems to be a razor fine line between unlock and lock. And the instructions aren’t much help on this point. Basically you want to press and hold for less than 2 seconds to unlock so you can fly. If you still have trouble, make sure the joysticks are in their lowest/neutral position (particularly the throttle). Otherwise the F100 is a blast. For the money I would highly recommend it. It includes a simple transmitter radio, which is great because I can see we are going to be getting into some money as we move into FPVs. The radios, FPV goggles and drones themselves are all “next level” (I spoke to one father-son team on the amateur racing circuit and they are investing about $7,000 per year into the sport. That’s nothing compared to something like moto-cross or equestrian sports, but still). The big question with all this is: will Aren have as much fun at this sport as I’m about to? Great! I read it all I hope this helps someone in need. Thanks for sharing the “unlock” trick, manual and elsewhere didn’t cover it! Now I get to learn to fly my little ghost! Ta! yeah – it does seem pretty good. Since christmas I’ve gone from at $25 walmart special to a tiny FPV (both seemed to have a feel for how to catch the wind and become unrecoverable) to the F100. It’s so big I can see it, and it’s got enough speed to come back against the breeze overhead that feels like almost nothing at all at ground level. But: Their documentation is a problem. The camera button, with explanation of what it does, doesn’t work with the camera it comes with, and the “upgrade” cameras specified in the manual are vaporware. They ought to say in the manual that the only way to use the camera with it is in video mode – push the button before takeoff and after landing. The transmitter calibration cannot be initiated, at least as specified. …and the lock/unlock procedure. that the drone’s back lights also come on.” should be “With the left stick at the bottom position, press the red button briefly and release. A long beep will sound and the drone’s back lights should also come on.” If you listen for the beep and then release the button, you’ve just reaffirmed the lock.